b) stir-fried broccoli is amazing. Like, addicting amazing. 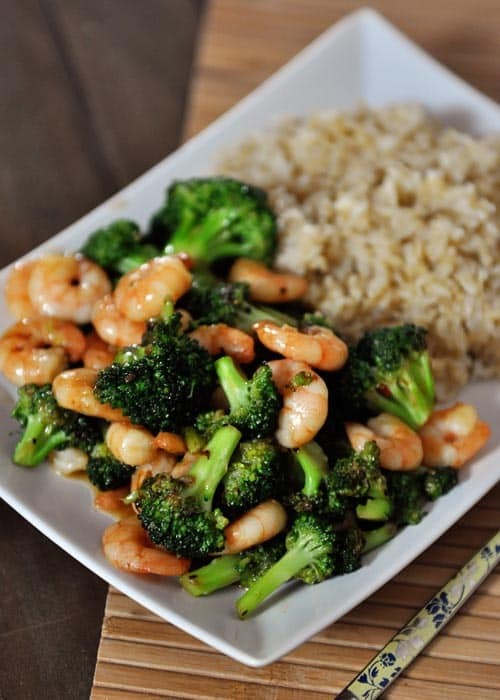 And actually, the broccoli is the star of the show even when I throw in shrimp or chicken. 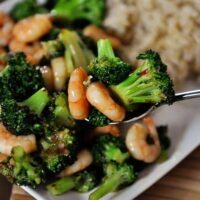 Something phenomenal happens as the broccoli caramelizes in the hot skillet and is lightly dressed with a silky, flavorful, Asian-inspired sauce. I literally could eat the entire pan full of broccoli. And my kids devour this like no one’s business; usually trying to play the game of “Whoa, Ty, did you see that huge gorilla outside the window?? ?” in an effort to stab their innocent brother’s last piece of broccoli right off his plate. Adding meat helps stretch the meal a bit but you could easily double the broccoli/sauce ingredients for a completely meatless meal. And I hope you noticed that it is shockingly quick to make (the brown rice will take much longer than the actual stir-fried broccoli so plan for that). Um, let’s see, what else? Oh, I’ve also served this with quinoa instead of brown rice. Delicious. Basmati rice? Fantastic. Or just whipped up as an amazing side dish. Unreal. I don’t know about you, but I’m craving some serious broccoli after our discussion. I guess there are worse things. In a large 12-inch nonstick skillet, heat the oil over medium to medium-high heat until hot and rippling. If using meat, add it now and stir-fry until cooked through. Remove the meat to a plate. Add the broccoli to the hot skillet (you may need to add another teaspoon or so of oil if the skillet is completely dry) and cook, stirring often, until the broccoli has turned bright green and is lightly browned, 7-9 minutes. It won't cook much more after this so it should be crisp-tender. I like a bit of bite to the broccoli but if you want it more tender, add on a few minutes cooking time. Stir in the garlic and cook over medium to medium-high heat, stirring, for a minute or so. Whisk together all the sauce ingredients and pour over the broccoli. Add the meat if you cooked it in step 1. Stir the ingredients together until well coated with the sauce and simmer for 1-2 minutes. Add additional salt and pepper to taste if needed. For the Thai chili sauce, you can substitute Asian chili-garlic sauce or hoisin sauce. I've used both before with good results, although the flavor is a bit different. ﻿When using meat, I usually cook about 1 to 1 1/2 pounds of shrimp or chicken pieces lightly sprinkled with salt and pepper. You could try asparagus or zucchini. Thanks so much! Happy you loved it! The sauce is really good! The only thing I know to do different next time is to use fresh broccoli and not the frozen florets in the steam bag. It wasn’t bad but some got just a bit too mushy. My family (including my 1 year old) loved it! It will be one of our go-tos now that we have went to completely clean eating! Found this on Pinterest and have to say it is one of my favorite things I’ve ever made! I’m pregnant too and not even my normal food favs do it for me anymore. Will be adding to my rotation at least biweekly! Made it exactly as pictured with shrimp and rice! It helps thicken up the sauce. So my husband and I tried this with beef and it was so yummy that it is our go to recipe. We also now add snow peas and carrots. Thanks so much!!! Love this! We harvested the first broccoli from our garden this week and I made this recipe – my kids all wanted seconds, which has never happened before with cooked broccoli. A definite keeper! then I make your broccoli recipe & replace the shrimp w the tofu. Seriously easy & yummy & so nice to be healthy & still be an entire hit w the family! You really are a lifesaver with my meal planning (I have totally noticed how much my grocery bill is reduced because I am organized so thank you!) and just knowing I can count on your tasty recipes. I made this for the second time tonight – but tonight I made a Korean beef bowl recipe first and then stir fried the broccoli as per your instructions and added it to the beef bowl….it was amazing! The first time I had this delicious recipe I chose to have it meatless. I have to say it is versatile and yummy and I love that I can have such great recipes to work with – thank you so much! Mel, I’ve tried many of your recipes but I had to comment on this one because it was so incredibly good! I made it last night, following your recipe exactly, and added some shrimp and brown rice which made it a great meal for Lent. I have 3 kids who gobbled it up! My 7-year-old declared it tasted just like the Chinese food in the mall, which is a HUGE complement from her! They didn’t even ask for dessert after because they were so full from the broccoli and shrimp. So I just had to thank you for sharing this amazingly simple and healthy meal, it was a huge hit in my house of picky eaters. This was delicious! I added the shrimp and followed your instructions it was great! I used 1 tsp of sesame oil vs 2 tsp because it’s a little strong for me. Marci – I’ve used Frank’s, while it’s ok, it’s not my favorite. When I can find it, I prefer the Mae Ploy brand. I made this … It’s was ridiculously DELICIOUS! I added chicken to it as well. Buh-bye take-out Chinese menu. This is the best cooking blog. Ever! Thank you, Mel, for sharing your delicious, tried and true recipes! I would add red pepper flakes for an additional kick! YUM! OK, I’m embarrassed to admit, but I just let this recipe pass right by because it didn’t tempt me and thought I’d never make it. Well, I did tonight because I was craving veggies. I only made enough shrimp for the hubby and I because the kids don’t like it. BIG MISTAKE! I ended up not getting any because my kiddos picked mine right out of my bowl. The flavor was PERFECT! Not too spicy for picky eaters, but enough flavor to satisfy a foodie! I will be making this often! Thank you! Do you think I could do this with beef instead of shrimp or chicken? Any changes besides the meat if you choose to use beef? Rita – I haven’t tried it with beef but it’s worth a try. You might also like this Broccoli Beef recipe. Made this a few days ago. Was a big hit! I served it as a side dish and the boys preferred this to the main dish. Rarely ever do they choose a veggie over a meat! Thanks Mel! Wow! Talk about quick. I made this with shrimp & steamed dumplings before the rice cooler went off. 🙂 very much appreciated by the family. Thank you! Yes! I needed more recipes to use up the gigantic bottle of Thai chili sauce I bought from Costco. This is perfect. YUMMY! Quick and easy to make. I made it without the chicken or shrimp but I am sure it would be excellent with both. My picky hubby had two servings. K – hmmm, you could leave it out. It adds a really nutty, fragrant flavor. I don’t know of any great substitutions, although you could try toasting sesame seeds and sprinkling those on for a similar bit of flavor. I am vegetarian but I can’t wait to use the sauce for a stir fry! Karen – yes, I think mushrooms would be delicious! I made this last night for dinner, no meat, although I did double the sauce! My daughter & I devoured it. Really, really good. We are already planning our next time making this! Thanks Mel! Made this for lunch today. Really easy and great flavor. I made extra sauce as well. Made it with shrimp. The only change l would make is to double the recipe cause it didn’t make enough for leftovers, and it was tasty enough to want leftovers! Your timing is uncanny! I have a bag of broccoli florets from Costco languishing in the fridge, so I made this last night. It was fast and tasty. Thanks for another hit! No Thai chili sauce so we left it out, and my 7yo wanted carrots so we added them along with beef. I was planning on leftovers – but there are NONE!!! This was really yummy and a huge hit with our entire family!! I made this for dinner tonight and threw in some cooked chicken that I had in the fridge. It was very good. I doubled the sauce because I used probably 5 – 6 cups of broccoli and well . . . . we like sauce. Mel, I have loved everything I have made from your website. You are becoming a trusted “go to” place for me! Great job! My incredibly picky 2 year old who won’t eat anything except for fruit, cold cereal and yogurt actually ate 2 pieces of broccoli and a little bit of rice and said it was “so yummy!” We always say if he will eat it, it must be good! Christin I’m with you!! I’m focusing on the “meatless” option for this and trying not to look at the picture with the shrimp… I’m still in first trimester and things like that I used to love sound just wrong now! 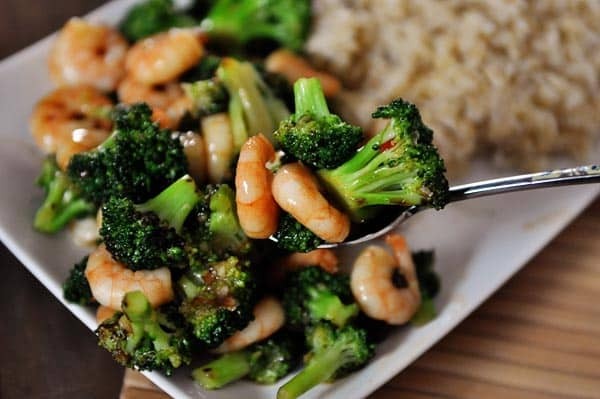 LOL But I never thought of shrimp with stir-fried broccoli so I’ll have to try that in a few months! What happened to the “save recipe” button?? So are you saying that this recipe would turn my oldest, who simply cannot stand broccoli even though she’s tried and tried (really she has! ), into a broccoli lover? I have tried every which way to get her to enjoy vegetables (and not just suffer them as she does now). I even bought a ‘spiralizer’ and learned the hard way exactly just how sharp those blades are (very. they’re veryvery sharp). If this is the answer, I will owe you big time! Quick question, if you are adding meat to this do you increase the sauce or keep the sauce amounts the same? Theresa: I’ve noticed fresh broccoli and frozen are really not that different. My suggestion would be since you’re working with a hot pan (similar to using a wok), defrost your broccoli first and pat it as dry as you can before throwing it in. Paris: Hoisin is a 0 on the spice scale, but the Hokan brand of chili garlic sauce (I can’t vouch for huy fong’s since my grocery doesn’t carry it) is not too bad. It has a little heat but it’s a very mellow and gentle heat; not bright like tabasco or sriracha. I don’t use heat a lot (some days even japaleños are a bit much), but I use chili garlic sauce how a lot of people use sriracha: on practically everything I eat. If you’re worried, test it and start small, but it’s a great sauce. You could also mix the chili garlic and hoisin for a similar sweet-spicy taste. Oh my goodness…I am going to have to try this asap! First, because I love broccoli when cooked with asian flavors. Second, because I bought some sweet chili sauce for a recipe and don’t know what else to do with it! 🙂 Thanks for sharing! I can’t wait too try this. I’ve seen other recipes but they had too much stuff I don’t keep in my pantry. Ever since I fell in love with your sweet and sour chicken, I always trust you with asian food! I can’t wait to make this! I made this tonight and thought it was amazing. My grocery store didn’t have sweet chili sauce, so I mix garlic chili sauce with a packet of sweet & sour sauce (from Wendy’s). My 5 year old ate it super fast and my older two boys didn’t complain! Paris – definitely the hoisin will be the least spicy. In fact it isn’t spicy at all, it’s kind of like an Asian BBQ sauce. This looks delicious! I think it would be great with some spring rolls. Yum! Going on the menu! I’m so sad, Mel! I’m pregnant and so many recipes (yours and everyone else’s) that I look at make me never want to look at them again. I know my non-prego self would love this so it’s going in the vault. Thanks! Thanks for this recipe – I always love a good meatless option, and I have all of these ingredients on hand! I think I will try your suggestion of serving it with quinoa to sneak in the protein that way. Yum!!! Do you think frozen broccoli would work with this? Theresa – I haven’t made it with frozen broccoli but my recommendation would definitely be to try it with fresh if you can! What is the note about the thai sweet chili sauce? This sounds amazing! Can’t wait to try it. My kids love broccoli already so this will be a hit before they taste it. Sarah – the note is listed right above the ingredients – I suggest a few options to sub out the Thai chili sauce.